This is a very short post on what I ended up doing to get an OpenJDK 11 build for Raspbian on my Raspberry Pi 3. 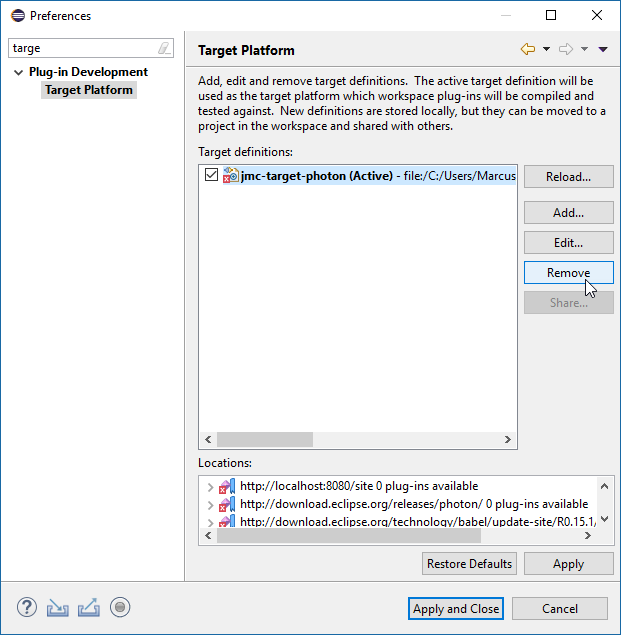 The java download page is here https://www.bell-sw.com/java.html. You could, for example, use the flight recorder to record sensor information. Another alternative would be using the Azul Zulu JVM, which also has a working Flight Recorder implementation in their JDK 11 arm32 builds. Distributed tracing has been of interest for a very long time. Multiple companies have sprung up around the idea over the years, and most APM (Application Performance Management) solutions are built around the idea. Google released a paper around their large scale distributed systems tracing infrastructure in 2010 – Dapper, and there are now several open source alternatives for distributed tracing available inspired by the paper, such as Jaeger and Zipkin. 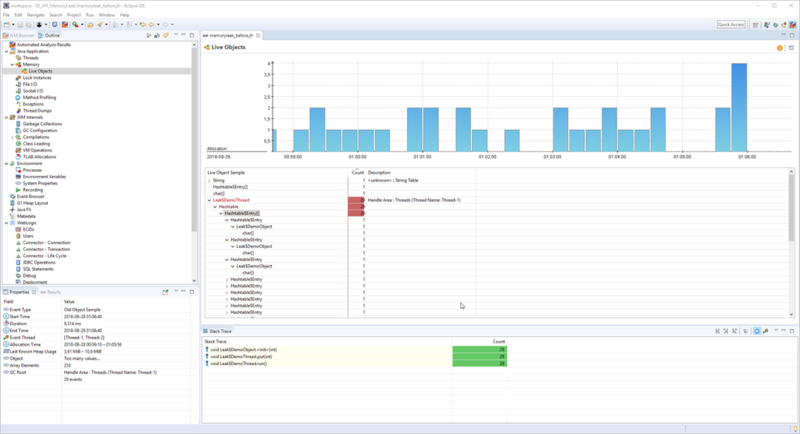 In Java land, pretty much all of the APMs are doing pretty much the same thing: they use BCI (byte code instrumentation) for getting the data, and then they present that data to the end-user in various ways, oftentimes using some kind of analysis to recognize common problems and suggesting solutions to the end users of the APM. The real differentiation is knowing what data to get, and what to do with the data once captured. Also worth noting is that a Scope is a thread local activation of a span. 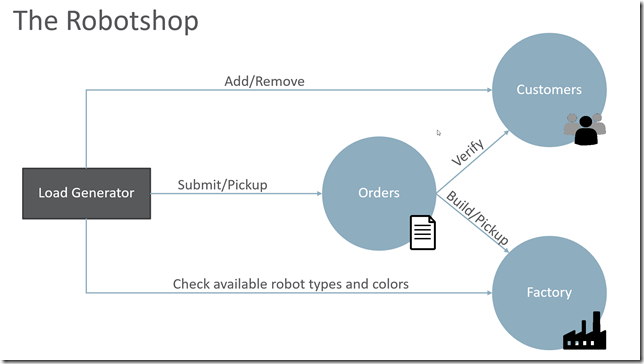 As an example, we’ll be using a simple application consisting of three microservices. It is part of the back-end of a fictional robot store. Robots can be ordered at the Orders service, and they will be produced in a Factory. There is also a Customers service keeping track of the customers. 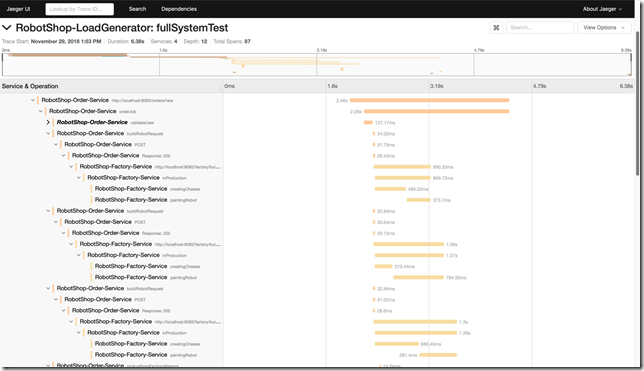 Finally there is a load generator that can be used to exercise the services. In this case I have scrolled down a bit to focus on the factory. As can be seen, there is great variability in the time it takes to create a chassis and/or paint a robot. We have multiple production lanes, and we’d expect times across the factory lanes to be more even, not to mention much faster. So what gives? Now, sometimes the tags may include crucial pieces information that may help you solve the problem without needing any additional information. In this particular case, though, knowing that we were building a pink BB-8 isn’t really doing the trick. What would be the next step? All too often the next step would be to look at the code around the instrumentation point, trying to figure out what was going on at the time simply from analyzing the code. Sometimes that may be quite hard. The problem may be in third party code not expected to behave badly. 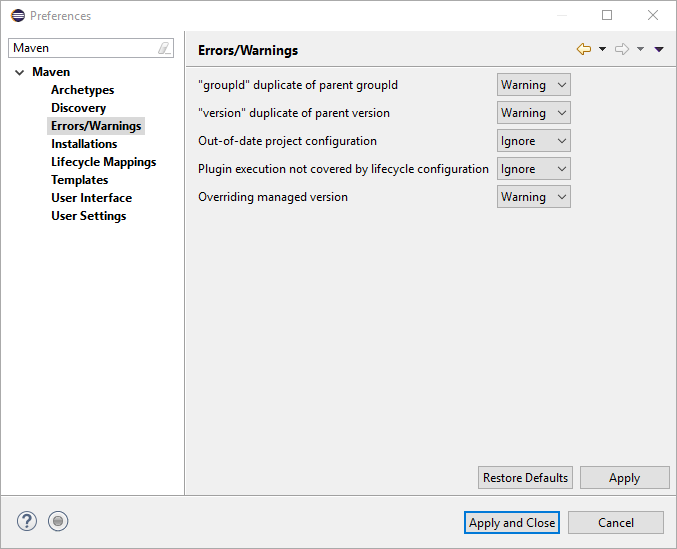 There may even be some other piece of code not directly in the code path causing the problems, perhaps an agent misbehaving and causing long lasting safe points in the JVM. For Code One I wrote a little delegating JFR tracer, which allows you to record contextual information into the flight recorder. It was meant as an example on how to do deep distributed tracing. Deep enough to solve entire classes of problems that are hard to solve without more detailed knowledge. That’s it. When the tracer is running you will get contextual information recorded into the flight recorder. 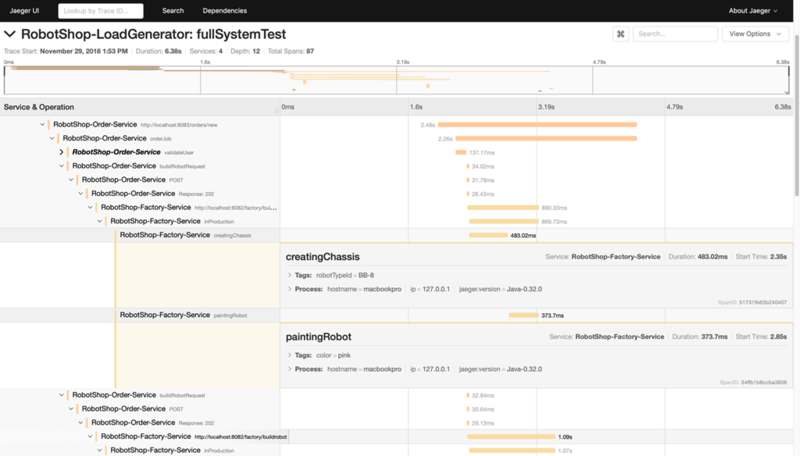 We can, of course, create a custom OpenTracing view to make it easier to directly finding and homing in on long lasting traces (I’ll create a repo for a ready made one with some more flair at some point). 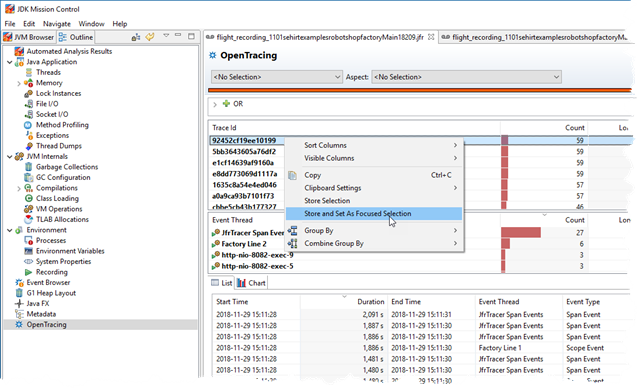 Simply go the the Event Browser, and right click on the Open Tracing folder. 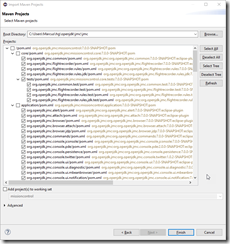 Select “Create a new page using the selected event types”. You will now have a new page in the Outline. You can right click on the title on the page to rename it and switch icon. Next select an arbitrary event, and right click on it. Select Group-By->Trace Id. In the new Group By table that appeared, select Visible Columns to enable (at least) the attribute showing the longest duration (the total duration of (wall clock) time the trace spent in the process that the recording came from). Next sort on the Longest Duration column. 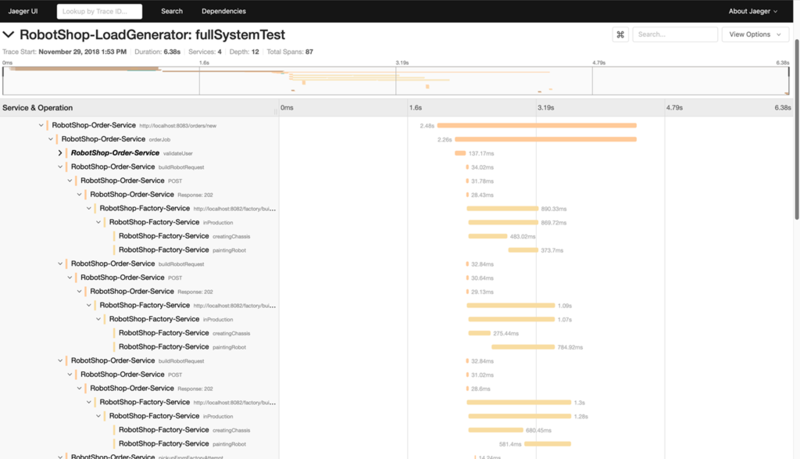 Distributed tracing is great, especially in today’s world of (very µ and plenty) µ-services. 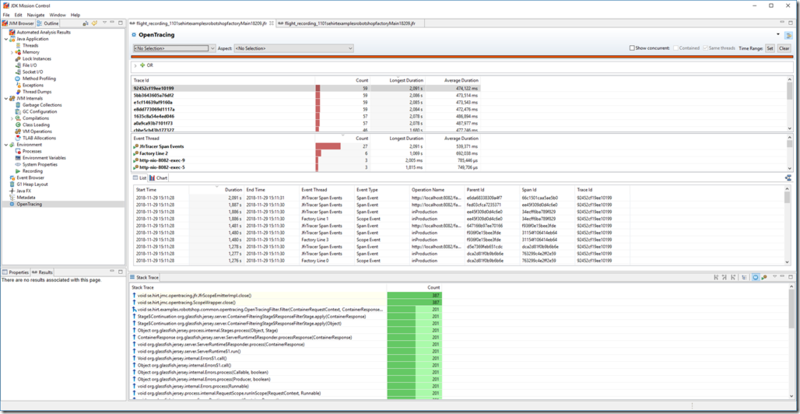 For the Java platform, injecting trace/span-identifying information as contextual information into the JDK Flight Recorder is dynamite. The JDK Flight Recorder r0xx0rz. Note that since the article was written, I have donated the tracer to OpenTracing. Sometimes you may not want to do a heap dump. 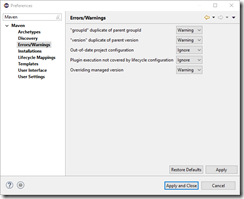 You may be running in an environment which is sensitive to latencies. Or you may be forbidden to create heap dumps, since the content will contain all your customer information and all of your organization’s account numbers, and if the dump ended up in the wrong hands, your entire business would be done for. Or you may have an 800+GB heap (yes, some customers run Java with enormous heaps with great success). And even worse, you may have a huge heap, with a relatively small ephemeral disk storage, not even able to store your huge heap dump. And, quite frankly, even if you get your 800+GB heap dump to your puny laptop, how will you open it? How much time will it take to calculate a dominator tree over that dump? 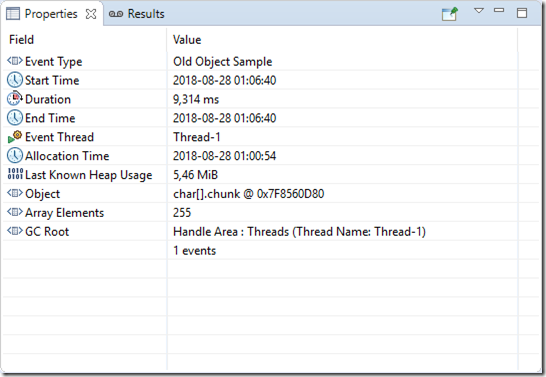 No matter the reason for you not wanting to do a heap dump, there is now (well, since JDK 10 really), a new JFR event allowing you to solve memory leaks without having to do full heap dumps with very little overhead. Black magic you say? Yes, awesome, yummy, black magic. At the heart of the red pentagram (with a black wax candle on each point and encircled with salt) is the Old Object Sample event. It was introduced in JDK 10. It basically tracks a fixed number of objects on the heap, for as long as they are live. To not incur massive overhead, they are selected in a similar way that the allocation event samples are picked – upon retiring a TLAB, or when allocating outside of TLABs. So, a sampled subset of the allocations get tracked. The samples are then stored in a fixed size (256 by default) combined priority queue/linked list, with weak references to the samples. If sampled objects are garbage collected, they are removed and the priority redistributed to the neighbours. The priority is called span, and is currently the size of the allocation, giving more weight to larger (therefore more severe) leaks. Once the recording is dumped, the paths back to the GC roots can be calculated. I write can, since this is optional – it is something that must be enabled in the recording, or as a parameter to e.g. jcmd when dumping the recording. If the reference chain is very deep (>256 object references), the reference chain will be truncated. It is also possible to specify a time budget, so that the time searching references can be limited. For example, imagine a linked list occupying most of the heap, and the sampled object being the tail of that list. The reference chain for that tail sample would span almost the entirety of the heap. With a large time budget, you would still get a truncated sample. 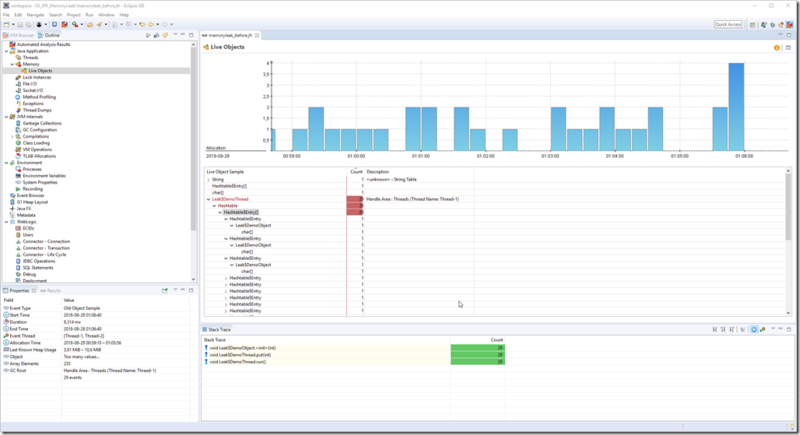 If you don’t want to spend so much time searching the heap, you could limit the time budget. There is some additional information. 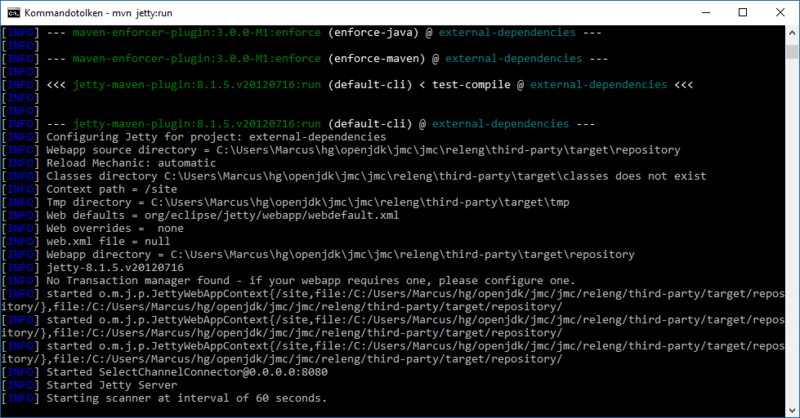 You can check out IMCOldObject in the OpenJDK JMC project source for more details. 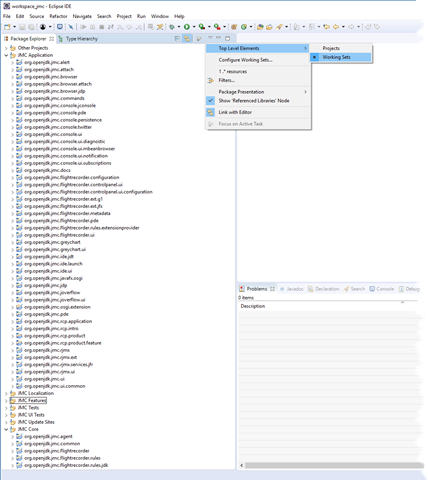 The best way to use the Old Object Sample event is to use it in a long running application. The longer the better. Statistically speaking, you want to offer as many chances as possible for a leaked object to end up being sampled. You’d also want to be well beyond the loading of all your code. Also, you would want to have been running long enough to be sure that transients have been cleared out. For example, if you have a session time-out of some kind set to 2 hours, and a ginormous application server and even larger application taking 15 minutes to start, then the first 2 hours and 15 minutes of runtime will not be that exciting from a memory leak hunting perspective. A simple way of using the event is to simply go look for events still around after the warmup phase, but before transient objects could reasonably still be around. An even simpler rule of thumb – look at the ones allocated in the middle of the time span. Since there is currently a bug open on JMC 7 (JMC 7 has not been released yet; we hope to fix it before we release), “picking the middle” is not yet possible. That said, in the picture above we can see that most live objects being tracked are actually held on to by the Leak$DemoThread, which has a Hashtable (what can I say, it’s a really old example program), having an entry array, containing an entry holding on to a Leak$DemoObject which in turn holds on to a leaked char. Now, JMC has a more sophisticated algorithm for selecting good candidates than “go for the ones in the middle”. It first check if we have an increasing live set. If so, and if we have Old Object Sample information, we will try to find good candidates using a combination of the distance from the root, the ratio of how many objects this candidate keeps alive to how many objects its root keeps alive and the ratio of how many objects the candidate keeps alive to how many objects are alive globally. For more information, check out the ReferenceTreeModel in the JMC project. This has already become a much longer post than I was planning on. 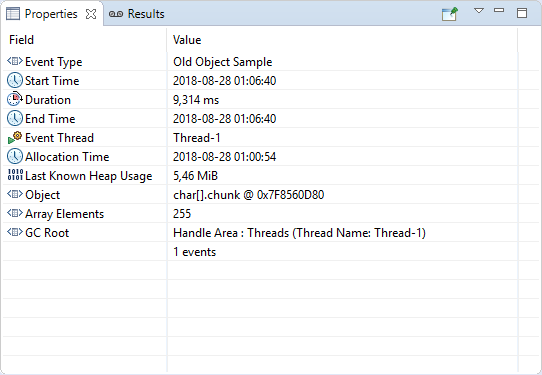 Anyways, if you want to experiment a bit with the Old Object Sample event, I have an upcoming JMC and JFR Tutorial that I am planning on “releasing” when JMC 7 is out. That said, you can already beta test it. There is some more information in the blog entry prior to this one. Even though JMC 7 is not GA yet, I thought I’d make the upcoming JMC Tutorial available on my GitHub. Hopefully this will be a good resource to help to learn more about using Mission Control 7 and Flight Recorder in OpenJDK 11. Please let me know if something is missing from the instructions! Oh my god. The amount of FUD concerning the JDK licensing for JDK 11 is just amazing. And how does the community react, you wonder? Yep, that’s right. “Oracle is the Devil”, “This is a bait and switch operation” etc. Ad nauseum. So, this is my personal take on open source: if I like a certain open source technology, and it helps me in my work, I support it. Either by contributing, or by paying (gasp) money for it. Especially if I would like the technology to thrive in the future. Technologies that are not supported, tend to die and be forgotten. 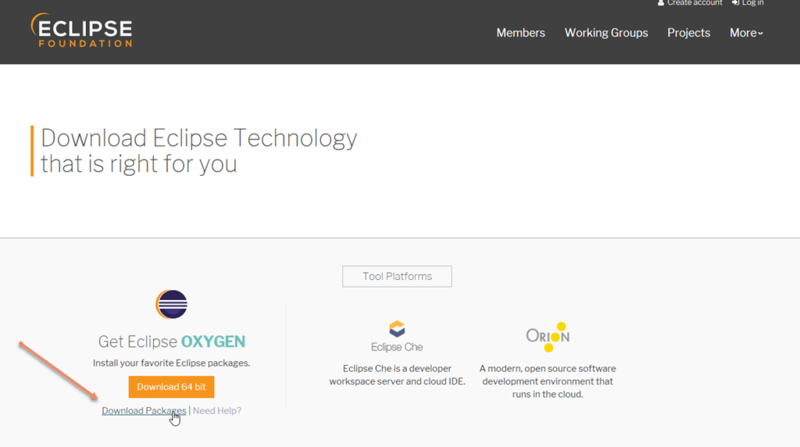 I have personally, for a very long time, paid a yearly contribution of 35$ to Eclipse. And that is even though my team, and countless of other teams at Oracle, have contributed to various Eclipse projects over the years. 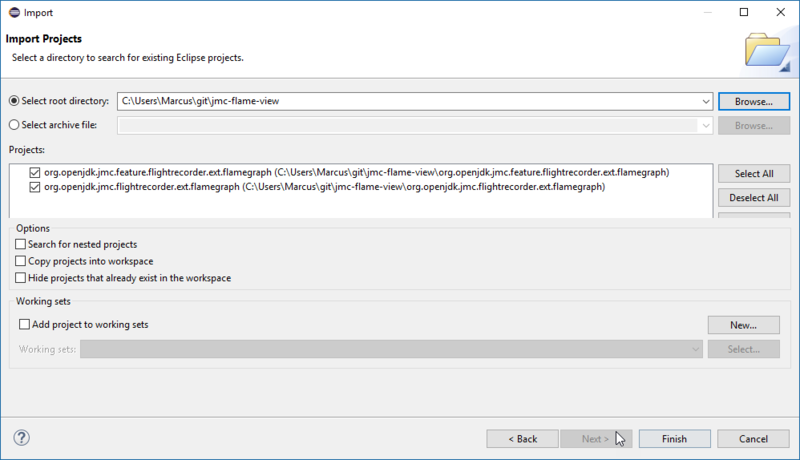 And, no, Eclipse does not provide me support for it. Oracle gives away countless of highly regarded technologies and starts releasing free OpenJDK builds. Parts of the Java community throws a fit. Note that the last few years, the HoL has been full – it may be a good idea to register for it early. 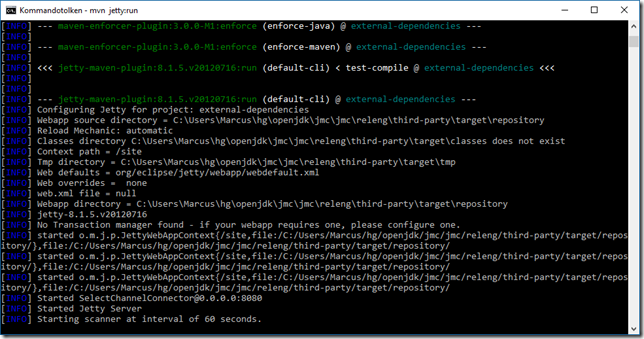 Especially now that JMC/JFR is being open sourced (JDK 11, JMC 7). Looking forward to seeing you at Code One! Here is a link to the sessions in the content catalogue. 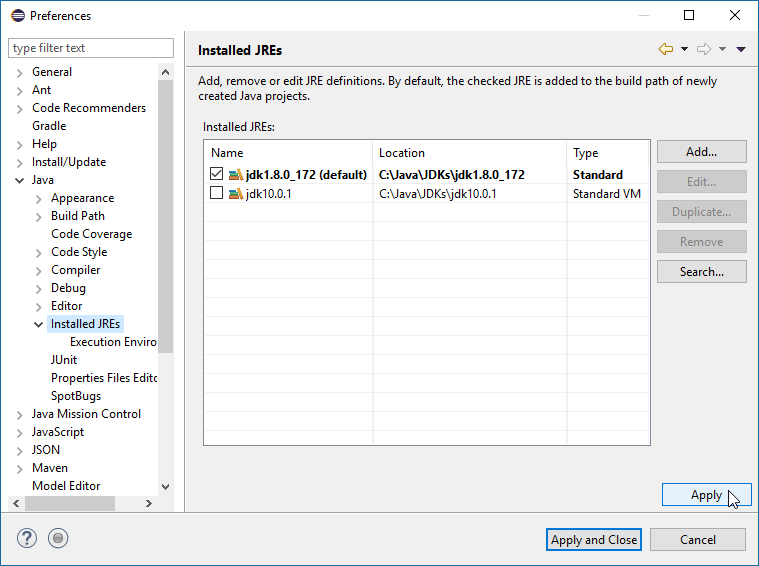 With JMC 7, we are switching to a new delivery model, with a separate installer for JMC. 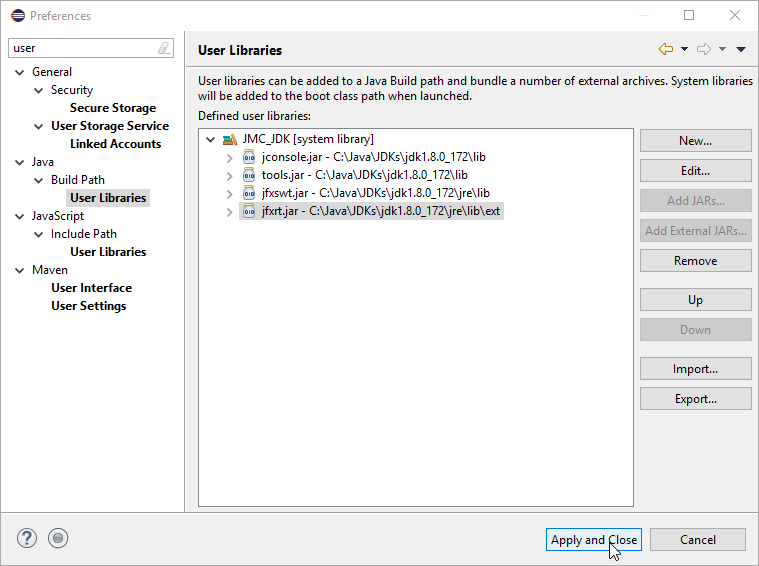 There are multiple reasons for this, such as having one deliverable which supports both OpenJDK and the Oracle JDK, and wasting less disk space for those of us having multiple JDKs installed. We’re still working on providing a good way to provide feedback. 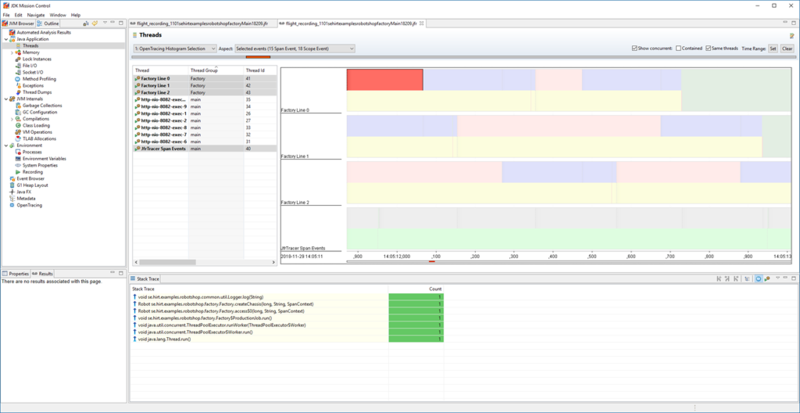 Within a few weeks, you should be able to provide feedback through webbugs. Until then, the best way is to talk to us at the OFTC #jmc channel. 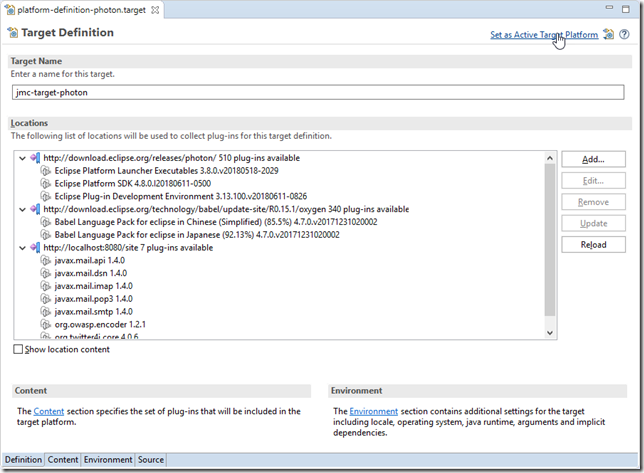 Now that Eclipse Photon has been released, there are a few things you need to do to keep your JMC builds happy. Then press “Apply and Close”. 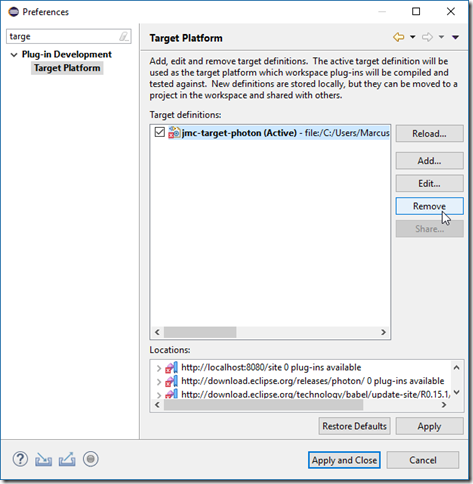 Next open the releng/platform-definitions/platform-definition-photon/platform-definition-photon.target file (File | Open File…). In the upper right corner, press Set as Active Target Platform. 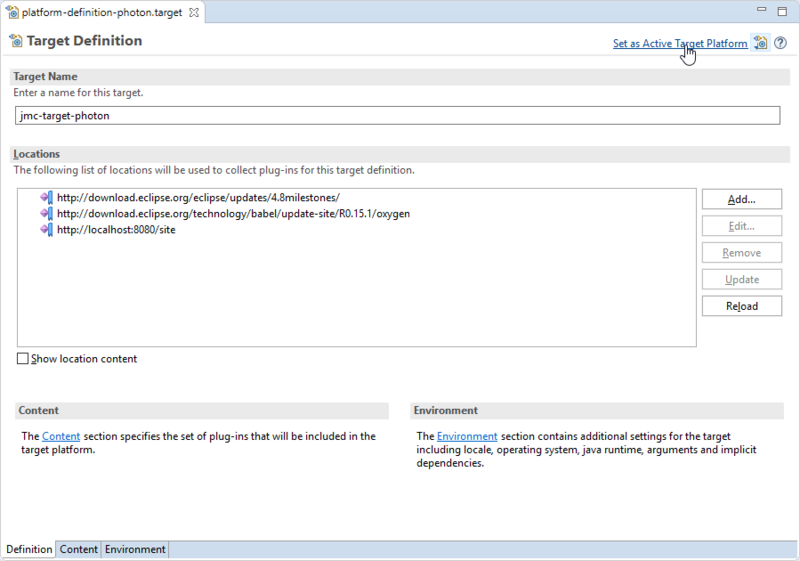 The last blog (about Fetching and Building OpenJDK Mission Control) earned me questions on how to get the source into Eclipse to start playing around with it. 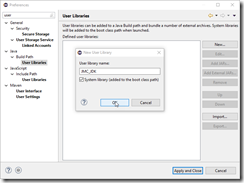 This blog post will assume that you have first successfully completed the steps in the Fetching and Building OpenJDK Mission Control blog post. First of all you should download the latest version of Eclipse. 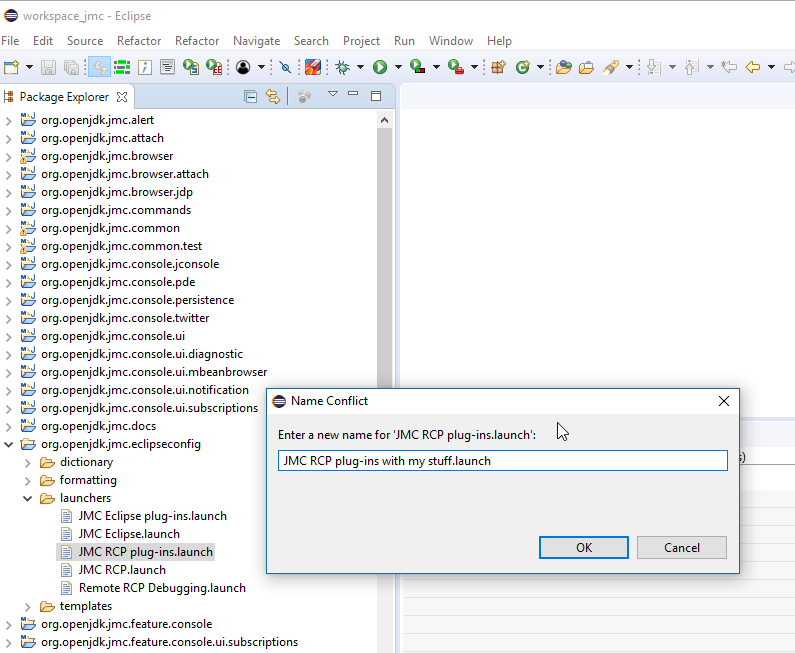 JMC is an RCP application, and thus, the easiest way to make changes to it, is to use the Eclipse IDE. There are various Eclipse bundles out there. 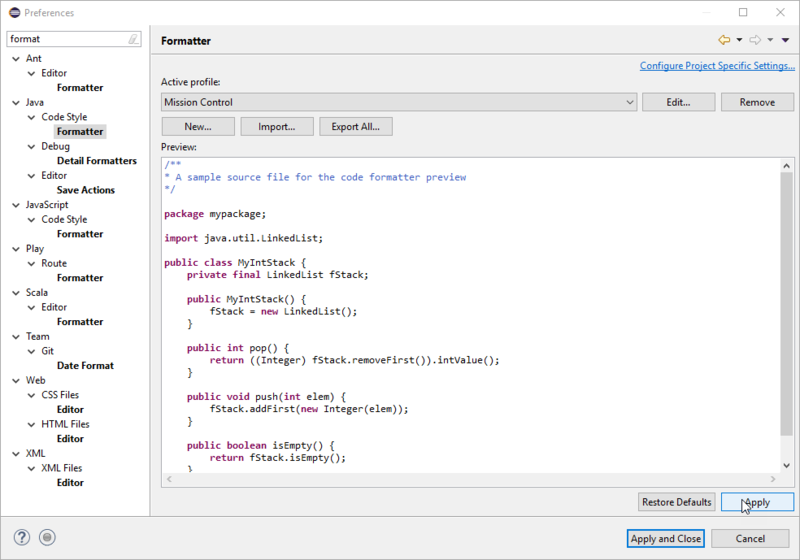 Get (at least) the Eclipse IDE for Eclipse Committers. 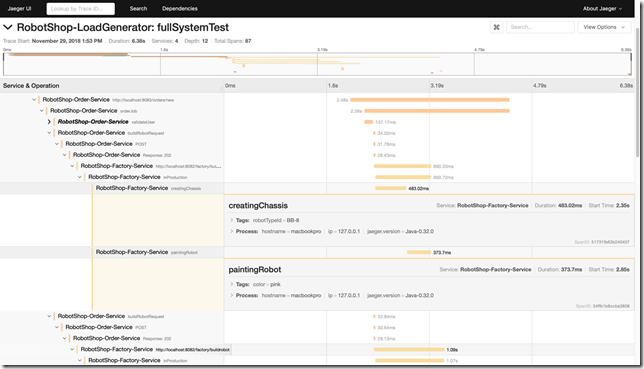 It adds some useful things, like PDE (the Plugin Development Environment), Git, the Marketplace client and more. 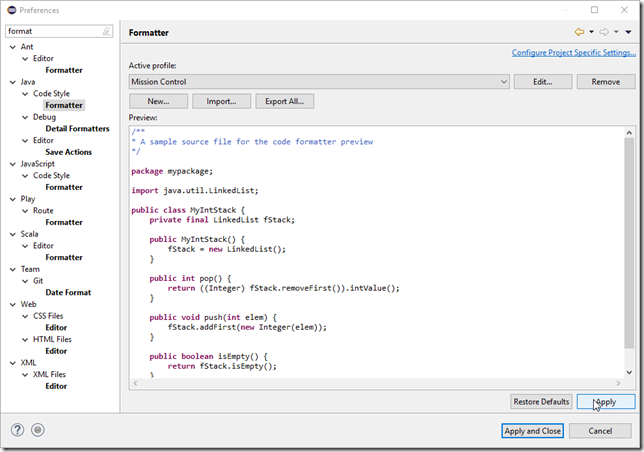 You can also use the Eclipse IDE for Java Enterprise Developers. You will need an Eclipse 2018-12 or later! 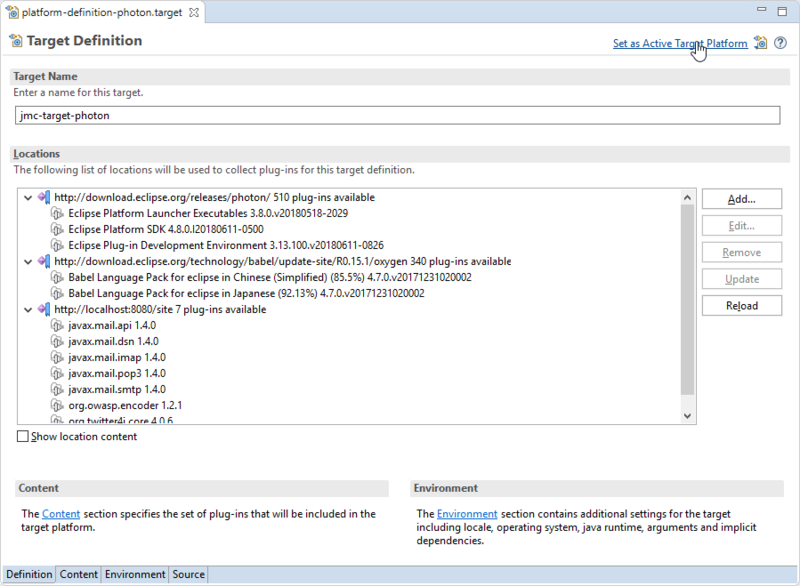 To get to the screen where you can select another packaging than the standard, click on the Download Packages link on the Eclipse download page. 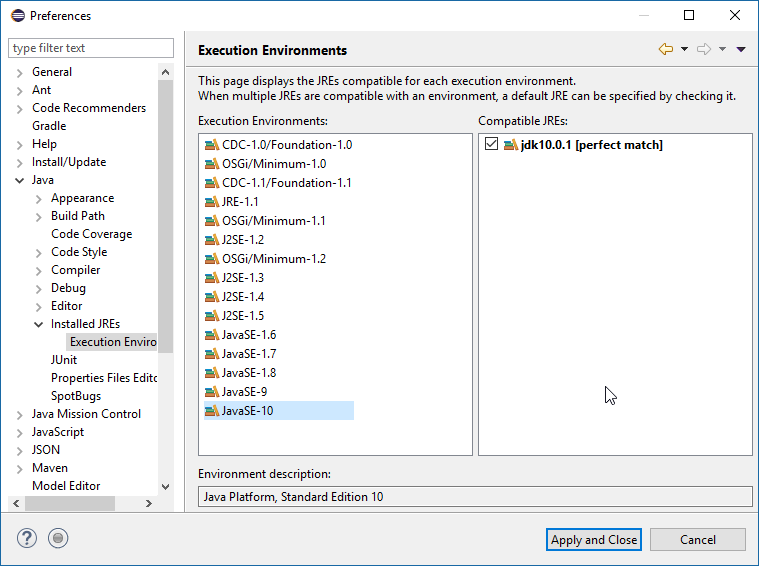 Since you’ve already built JMC outside of the IDE, you already have a JDK 8. 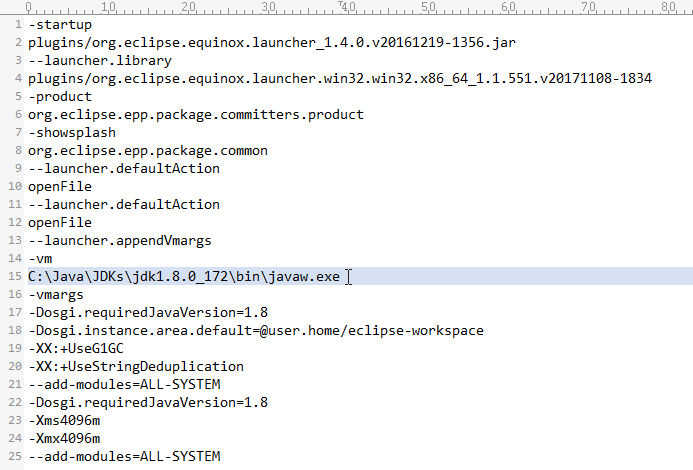 You probably also want to have a JDK 11 set up in your Eclipse. Download and install a JDK11, then open Window | Preferences and then select Java / Installed JREs. 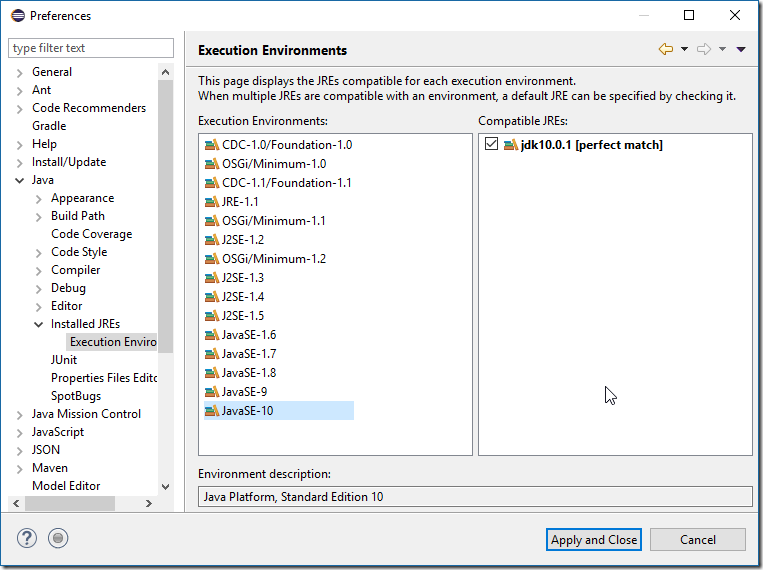 Add your favourite JKD 8 and JDK 11 JDKs (Add…) and then use Java / Installed JREs / Execution Environments to set them as defaults for the JDK 8 and JDK 11 execution environments. 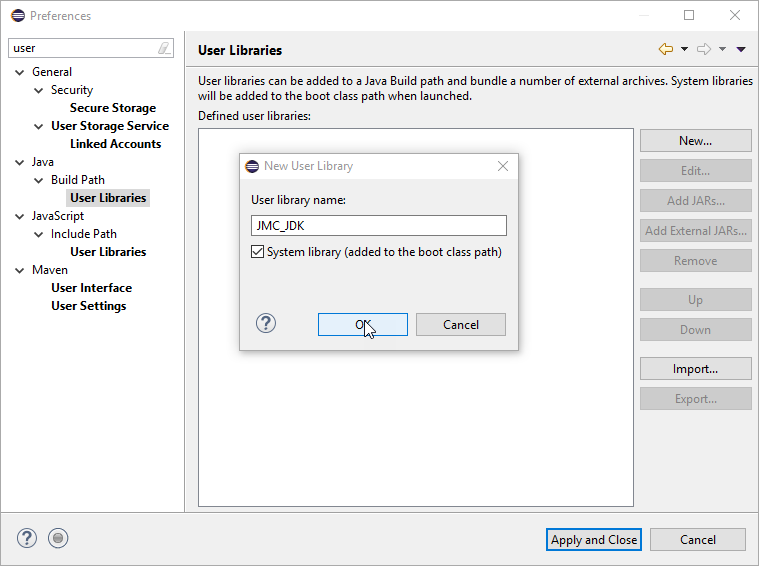 If importing the application projects, make sure you create a user library (Preferences | Java/Build Path/User Libraries) named JMC_JDK, and add (Add External JARs…) the following JARs from a JDK 8 (u40 or above) to the User Library: tools.jar (/lib/tools.jar), jconsole.jar (/lib/jconsole.jar), jfxswt.jar (/jre/lib/jfxswt.jar), and finally the jfxrt.jar (/jre/lib/ext/jfxrt.jar). Is the Jetty server from the previous blog up and running? Click the Set as Active Target Platform link in the upper right corner. 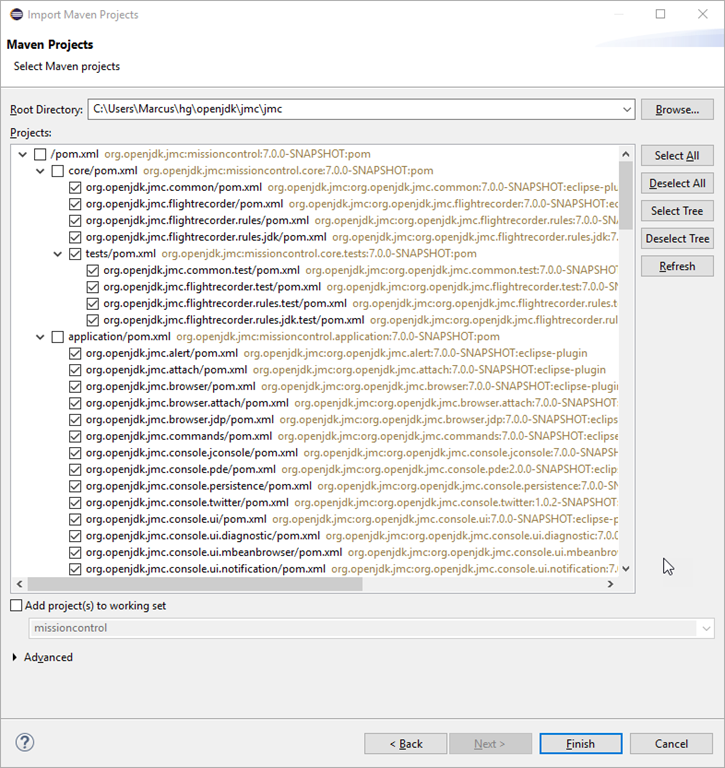 Now the preparations are done, and we can start importing the projects. Woho! First we will have to import the core projects, since they are built separately from the rest. 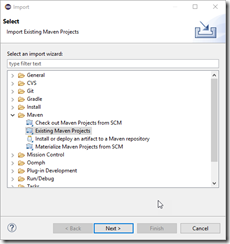 Select File | Import… and select Maven / Existing Maven Project. 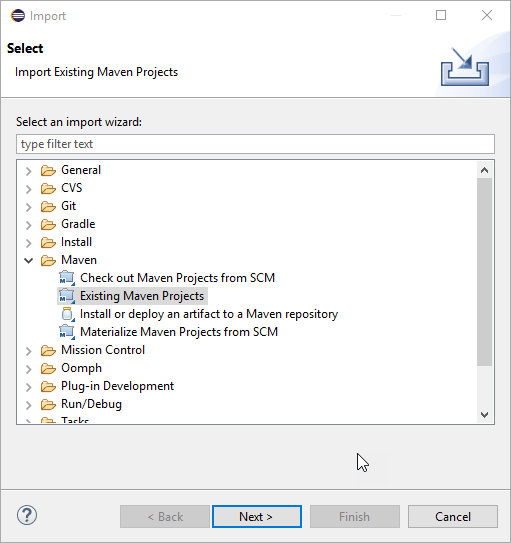 Again, you may want to skip the top level poms (/pom.xml, application/pom.xml etc), and the uitests (at least until we fix so that the jemmy dependency can be downloaded from Maven Central). Next we will import the project which contains the launchers. 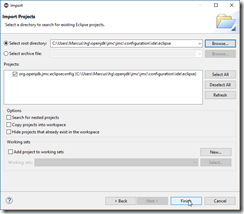 Select File | Import… and then select Existing Projects into Workspace. 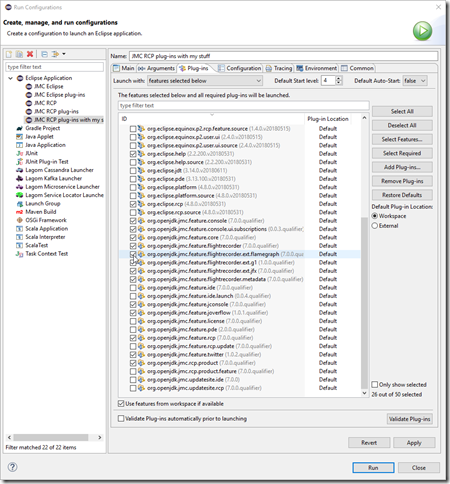 Find the configuration/ide/eclipse folder and click Ok. 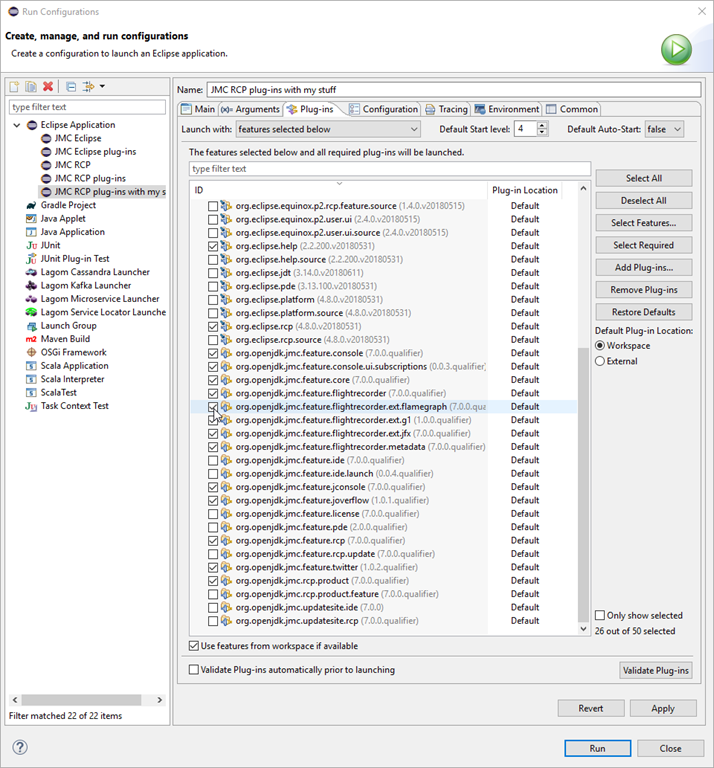 If you have the spotbugs plug-in installed, you should also import the spotbugs excludes (configuration/spotbugs/spotbugs-exclude.xml). 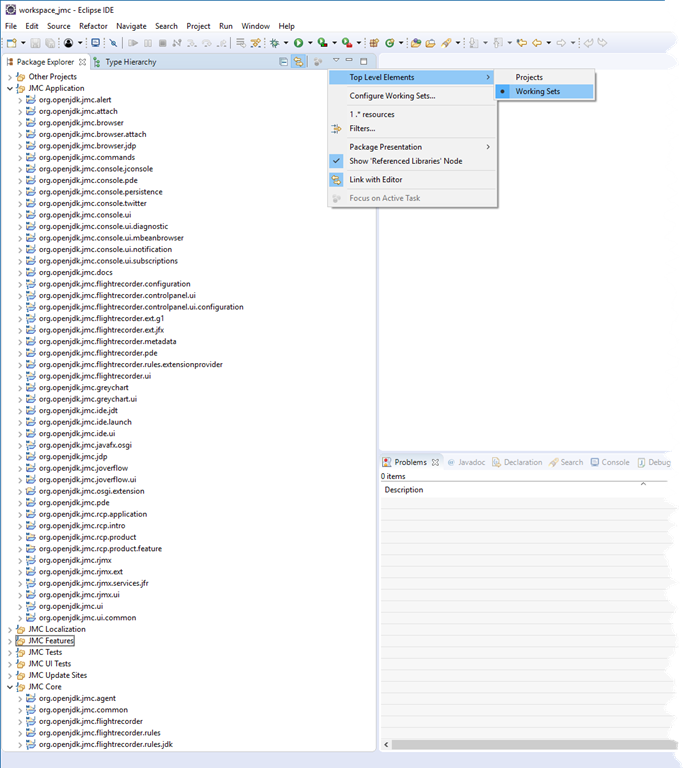 There is also a common dictionary (configuration/ide/eclipse/dictionary/dictionary.txt) and templates (configuration/ide/eclipse/templates/JMC templates.xml) which you may find useful. The flame graph view may be included in JMC at some point. If so, then there will probably be some other plug-in somewhere that will serve as an example. First install Git. If you, on the command line, can run git –version, you’re all set. Next we need a launcher which includes this new feature. 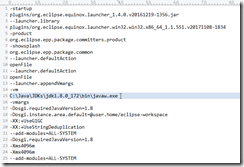 Go to the org.openjdk.jmc.eclipseonfig project and open the launchers folder. 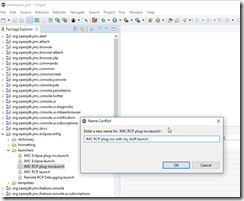 Copy and paste the JMC RCP plug-ins.launch file. Name the copy something. 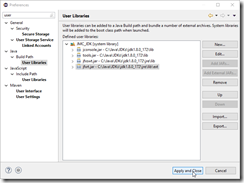 Click the run dropdown and select Run Configurations…. Click Apply and Run. Mission Control will start, with your new plug-in available. 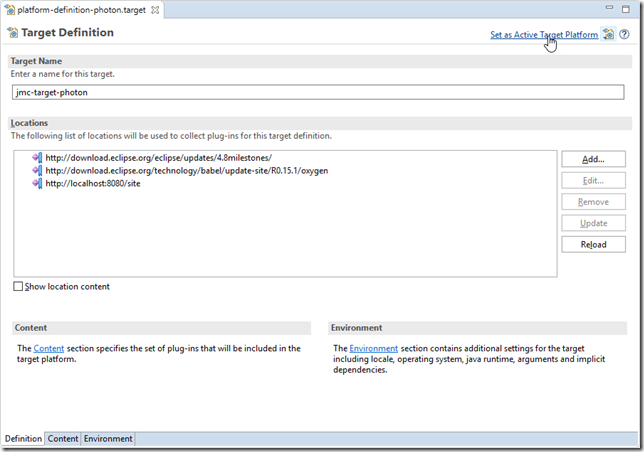 In the started JMC, go to Window | Show View | Other…. 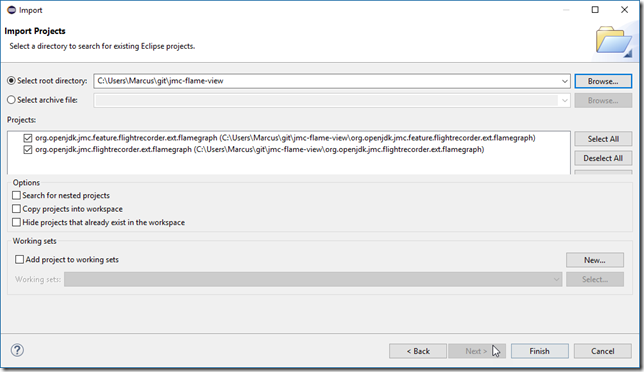 Select Mission Control / Flame Graph in the Show View dialog. 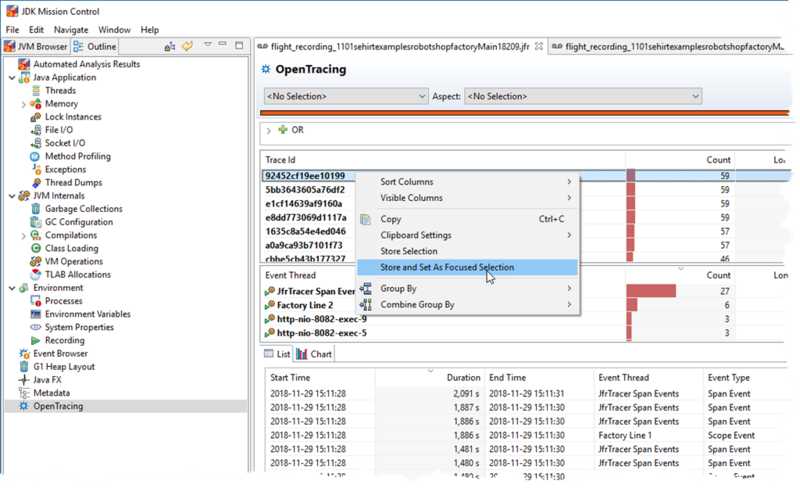 Open a Flight Recording, and click on something that would yield an aggregated stack trace, such as something in the Method Profiling page, or a class in the Memory page – you should now see a Flame Graph of your selection. 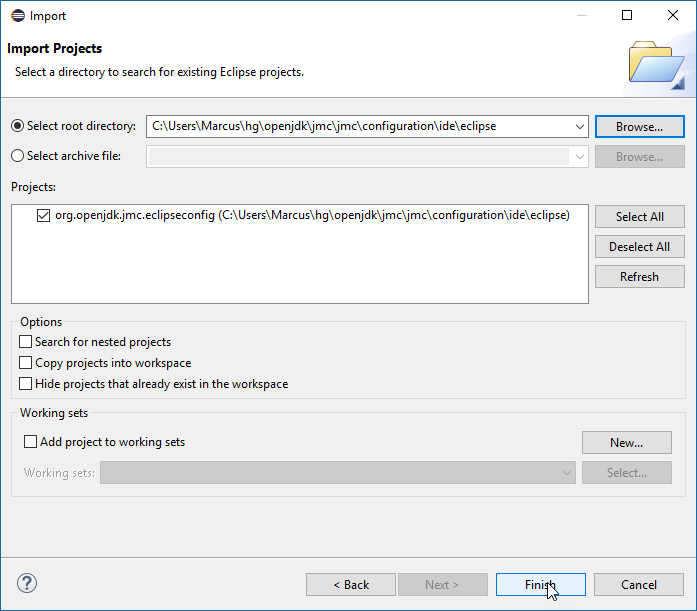 This blog post explained, in some detail, how to import the OpenJDK Mission Control project into Eclipse, and how to set up the workspace to work on the code. It also explained how to run the code with an additional plug-in from a separate repo. As always, please let me know if I forgot to mention something (except for the agent, which I will deal with in a separate post)!